From a Metaphysical perspective there might be some differences in characteristics between each Archangel, but for the most part Pagan Metaphysics holds a similar definition of these angels as is held by non-Pagan religions. Literally his name translates as "Master, of God" ie: A master who is of God. Gabriel serves as the messenger of God and is referred to as the "left hand of God". He first appears in the Book of Daniel in the Hebrew Bible. In biblical tradition, he is sometimes regarded as the angel of death, the prince of fire and thunder, but more frequently as one of God's chief messengers. His horse is named Haizum. The ruler of Shamayim, the First Heaven. One of the Angels of Death. Literally his name translates as "who is like God"
He appears in the Book of Daniel in the Hebrew Bible and in in the Book of Revelation. The Archangel of Mercy, Repentance and War (or Battle), his name is a battle cry for the host of angels as they battle for mankind. Bringer of patience, courage, motivation, achievements and ambition. He is sometimes associated with variant colors of Red, such as orange and violet. Literally his name translates as "Friend of God"
He appears in The Book of Revelations, Matthew, Daniel and the Book of Enoch. He is not mentioned by name in the Canonical writings of the Bible. Archangel of justice, fairness and harmony. Raguel watches over other angels to make sure they are working well together with mortals in a harmonious and orderly fashion according to Divine order (Rev 3:7 - 13) and will. He is the basically the Sheriff of divine will, which means he is in constant counsel with the lawful and good deities he serves to keep the divine world pure of corruption. As the guardian of justice he is known for handing out punishment when transgressions occur. This makes him an Archangel of karma. Literally his name translates as "God has healed"
First appears in the Book of Enoch.In Christianity he only appears in the deutero-canonical Book of Tobias (Tobit). Archangel of Healing, Science and Technology. Guardian of the Tree of Life. As the Archangel of healing, he is sometimes associated with shades of green in candle magik. Literally his name translates as "Mercy of God"
He is not listed by name except in the Book of Enoch as one of the 7 archangels. 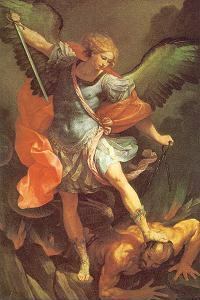 Remiel is the Archangel of hope and guidance. Guiding souls of the faithful into Heaven. He is responsible for divine visions and is considered to be the messenger or guide of psychics. Hebrew Sari'el, also listed as Araziel. Literally his name translates as "light of God" or "moon of God"
Sariel is represented as a female, ruling over visions and wisdom. She also is depicted with warrior abilities. She's often associated with holding the knowledge of magik and rituals. Associated as one of the Angels of Death, she rules over judgment with her wisdom. Literally his name translates as "Flame of God"
Often sent by God to give instruction to mortals. This often associates him as the Archangel of knowledge. He's also associated as the angel of poetry. Not often thought of an Archangel, it's important to remember that Satan was an Archangel long before he was associated as the Ruler of Hell and Evil, and nemesis of Mankind. Literally his name translates as "adversary" or "accuser"
In the Book of Job, ha-satan ("the adversary") is a prosecuting attorney against mankind in the heavenly court of God. He is known as the accuser and is the angel which questions mankind's loyalty to God. He argues that man is only loyal because God gives them prosperity. He is often sent by God to test Mankind's faith and loyalty. Because of these assignments, he is given the label of Angel of Evil. It would be more accurate to view Satan as playing the role of opposition to the rest of God's hosts of angels. Questioning their loyalty as well as that of Mankind. In many ways, it was a thankless job, but one assigned to Satan by God. Associated as the Archangel of Justice and Adversity, Satan is often used in candle magik with brown or black candles. It's unclear when Satan and Lucifer merged into one preceived being as the Devil and ruler of the Underworld. Lucifer was originally a Latin word meaning "light-bearer"
A Roman astrological term for the "Morning Star", the planet Venus. - In the literary tradition, Satan was called Lucifer before the Fall from Heaven. According to the legends of the rebellion, Lucifer was the chief in the hierarchy of Heaven, and the preeminent Arch Angel among all created beings in beauty, power, and wisdom. To him God allotted dominion and power over the earth; and even after his fall from grace, he seemed to still retain some of this power and status, if not all of it. Lucifer's sin was pride, an act of pure egoism and malice; he loved himself, above anything else and to the exclusion of everything, without the excuse of ignorance. As governor of Heaven, he was seated next to the Lord; but as soon as God left His seat, Lucifer, swelling with pride, would sit himself on the heavenly throne. A indignant Michael becomes enraged by Lucifer's pride and arrogance and battles with him,. After a angelical war, succeeds in banishing Lucifer and his followers from Heaven, casting all down to the infernal dwelling for all eternity. The one once called Lucifer in Heaven, was now named Satan on earth; the angels that joined with him became the demons, of whom he was lord. - The Urantia Book, published in 1955, explains Lucifer as a brilliant spirit personality, a "son of God" who at one time ruled over a set of inhabited planets. He fell into an iniquitous rebellion against the ordained universe in a denial of God's existence; saying he was God. "There was war in Heaven" but, according to The Urantia Book, the story has become convoluted over time. Unlike most legends that have Lucifer becoming Satan, the Urantia tells a story about Lucifer being friends with a spiritual being known as Satan. Lucifer recruited Satan, another brilliant being of the same order, to represent his cause to the universe authorities on earth. The then planetary prince of earth, Caligastia - one and the same as "the devil", believed Lucifer's cause and subsequently aligned himself, along with 37 other planetary princes in the system, with the rebels. They all attempted to take their entire populations of their planets under the assertion of a false doctrine, a "Declaration of Liberty" which would have driven them to darkness, evil, sin and iniquity.